This article is about visual artifacts or reproductions. For other uses, see Image (disambiguation). "Picture" redirects here. For other uses, see Picture (disambiguation). A man painting an image of himself. A scanned image of the definition of image and imagery, from Thomas Blount's Glossographia Anglicana Nova, 1707. An SAR radar image acquired by the SIR-C/X-SAR radar on board the Space Shuttle Endeavour shows the Teide volcano. The city of Santa Cruz de Tenerife is visible as the purple and white area on the lower right edge of the island. Lava flows at the summit crater appear in shades of green and brown, while vegetation zones appear as areas of purple, green and yellow on the volcano's flanks. 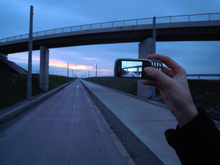 The act of photographing the environment with a mobile phone camera, while the display of the mobile phone shows a live display of the image. A mental image exists in an individual's mind, as something one remembers or imagines. The subject of an image need not be real; it may be an abstract concept, such as a graph, function, or "imaginary" entity. For example, Sigmund Freud claimed to have dreamed purely in aural-images of dialogs. The development of synthetic acoustic technologies and the creation of sound art have led to a consideration of the possibilities of a sound-image made up of irreducible phonic substance beyond linguistic or musicological analysis. Imagery is in literature a "mental picture" which appeals to the senses. It can both be figurative and literal. A moving image is typically a movie (film) or video, including digital video. It could also be an animated display such as a zoetrope. 1 2 Chris Baldick (2008). The Oxford Dictionary of Literary Terms. Oxford University Press. pp. 165–. ISBN 978-0-19-920827-2.